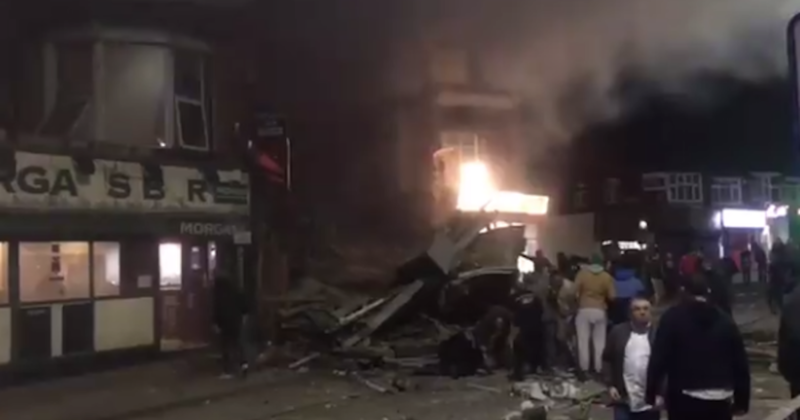 British police responded to a "major incident" in Leicester, England after an explosion collapsed a building along a busy thoroughfare. The cause of the explosion was not immediately clear. Authorities said "all emergency services" responded to the incident that closed Carlisle Street and part of Hinckley Road. Four people were taken to a nearby hospital after the incident, the East Midlands Ambulance Service said on Sunday] Local officials said they were conducting a search and rescue operation, the BBC News reports. A police spokesman said six fire engines responded to the incident. Leicestershire Fire and Rescue Service said a two-story building suffered a "pancake collapse" and said it was unknown if anyone was trapped in it. Officials said there is a Dangerous Goods team on the scene. Video footage of the scene showed debris on the road and smoke and flames still streaming out of a building. A witness on the scene told CBS News that she had heard a "bang" and thought it was a car accident. She said emergency services arrived within minutes and she could see the fire about 200 meters away.